Did you know that September 19th was Talk Like a Pirate Day? 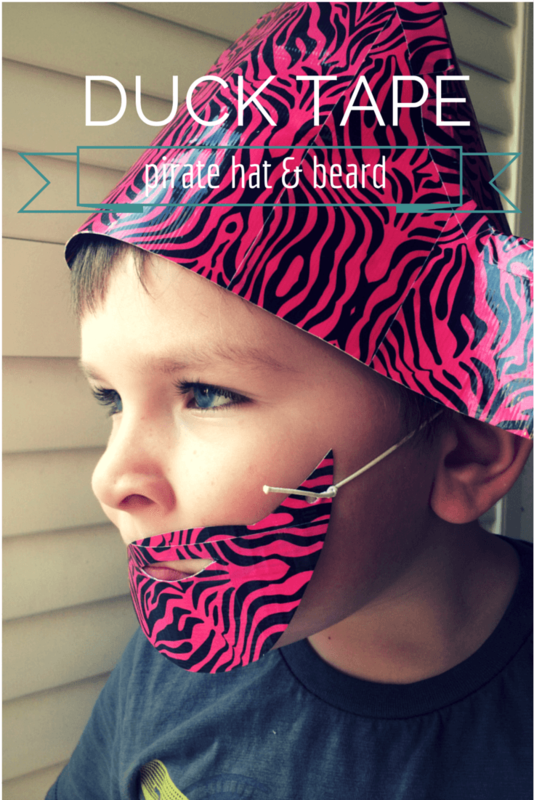 My 2 year old is currently obsessed with pirates and loves dressing up so it seemed like a great time to make her a pirate hat, beard and eye patch. A couple of weeks ago I told you how I was introduced to Duck Tape as a new tool for crafting. I knew it would be the perfect material to use. 1) I covered both sides of the sheet of plain paper in strips of Zig Zag Pink Duck Tape. I did this twice. 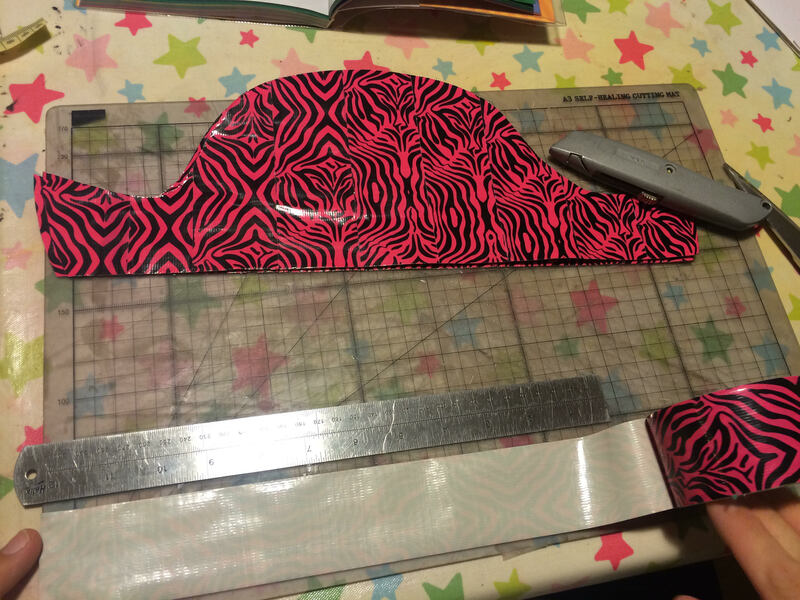 2) Then I took one of my daughters hats and measured the circumference, dividing the number in half, using this as a rough guide for the pirate hat template. I traced this onto my Duck Tape sheets and cut out my pirate hat. 3) I used small strips of Duck Tape to bind and seal the top two halves of the pirate hat together, leaving the bottom edge open. You could easily add a Jolly Roger from another colour of Duck Tape if you wish. 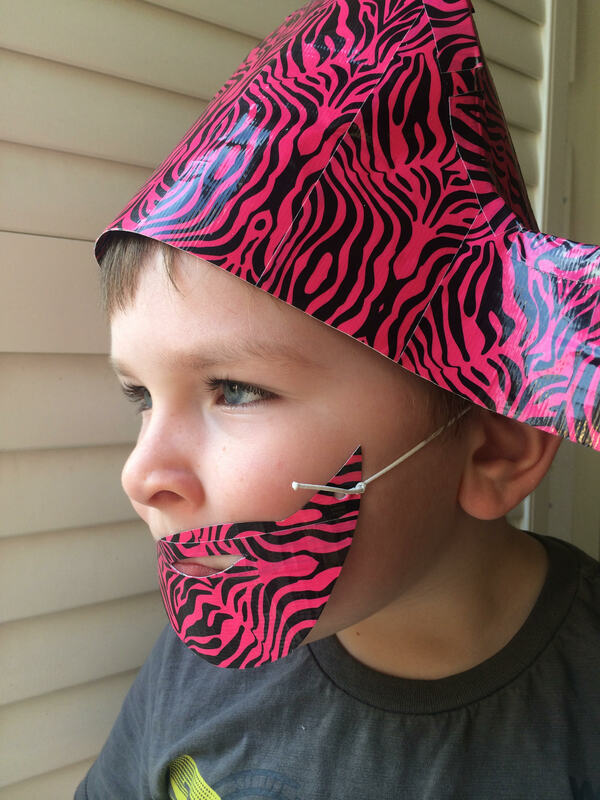 1) I used the left over pieces of Duck Tape to make a small beard. I made a paper template which I traced around lightly with a pencil on my remaining Duck Tape sheets and cut out. 2) I made two holes using the center punch and threaded and tied a piece of elastic through each hole. I can’t get my 2 year old to sit still long enough for a photo so here’s my 4 year old, it fits them both perfectly. This project actually used the entire roll of Zig Zag Pink Duck Tape but I wanted to make an eye patch to finish the costume off. Using Galaxy Duck Tape I covered a small piece of paper with the Duck Tape. 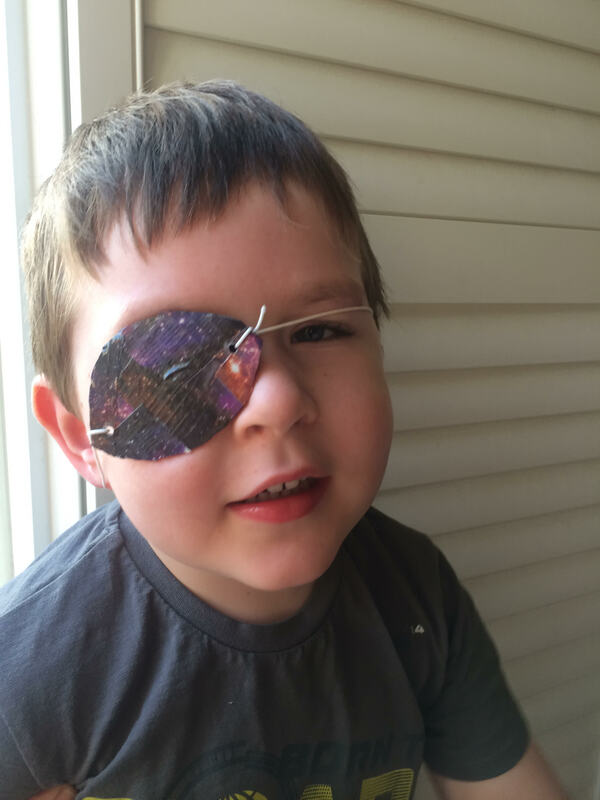 I cut the eye patch to the right size, made two holes on either side with the center punch and threaded and tied a small length of elastic. Duck Tape is really easy to use and super strong so I think these accessories will last for a long time. Duck Tape has recently added is adding to its hugely successful selection of coloured and patterned craft tapes, by launching some of the most popular designs from the States here in the UK. Products are in most good retailers including Hobbycraft, Asda and Amazon, for around £4.99. This is too cute! My husband enjoyed Talk Like A Pirate Day 🙂 I’ve got some Duck tape projects on my To-Do list. Stopping by from Parenting Pin-It Party. Love it! I really need to learn more crafts! fabulous, thanks so much for sharing on craft schooling Sunday! That looks great. I just bought some patterned duck tape, but need a project to use it, this has given me some ideas, thank you.